Just a good old fashioned melee hero, nothing special here, just filling a role that I felt needing to get filled, regardless of if it was good. e: I initially was going to use Maverick, and literally forgot Anthony was him……. so I decided on his female counterpart in his BR set. I don’t know what her name should be, maybe Shade after her BR skin’s name. Very nice concept, really. Liked how you introduced club perks at it in combination with In The Zone, which grants also armor. I would add also a tactical bonus, and replace Passing Zone for the perk that decreases Antimaterial change cooldown by 7 seconds, so it may become even more close-combat. EDIT: Also Phase Runner for the perk that lets you charge the punch. Movement speed perks are good, however, with that 3sec cooldown reduction I find it enough. 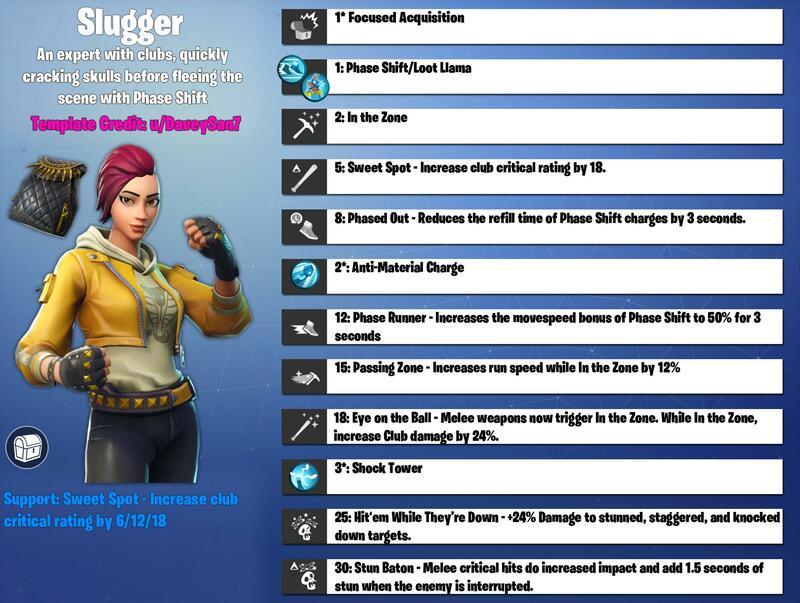 EDIT 2: Or, Phase Runner for a perk that increases clubs heavy attack efficiency by 150%, so Epic may make future clubs with crazy effects like they did with Spectral Sword… did you used it with Assassin Sarah? She is practically a mini-Dragon Slasher spammer, hope they improve the critical hit effect from her assassination perk, because the fixed 18 crit rate perk is way better than it. Phenomenal job. We need a club hero as well as an axe one. If this comes with a Stun Baton fix I’m game. Can I get the template for this? I am suggesting a Cuddle Team hero. Phase shift would make a melee focused hero viable because it is an infinitely better gap closer and escape compared to the ninja double jump. Love this.